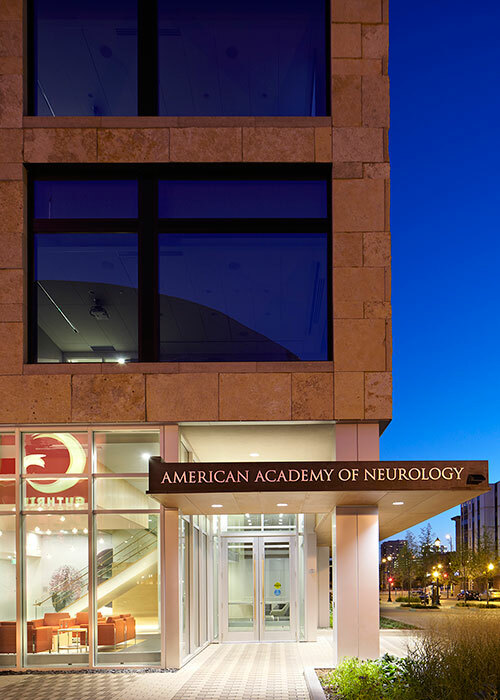 The global headquarters of the American Academy of Neurology is a 5-story, 63,000 square foot building located in the Minneapolis Mill District on the Mississippi waterfront. A good example of designing in a dense urban environment, the structure is situated on a very long and narrow site abutting the existing Guthrie Theatre parking ramp. Structural systems consist of concrete slab on grade beams at the main floor level, composite steel consisting of steel beams, metal deck and concrete slab, supported by steel columns at the second level and up, and a roof system framed using steel beams, steel bar joists, and metal deck, supported by steel columns. 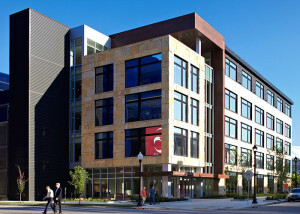 The exterior is Cor-ten steel, brick, and stone. The building is LEED certified.